The Ford Expedition is an SUV that has the technology you need to help keep you and your passengers entertained on long road trips. Staying connected on the road is made effortless and simple with the SYNC 3. If you enjoy listening to music, the available 12-speaker B&O system will be very beneficial. The vehicle also has a rear-seat entertainment system to make those long trips more pleasant for your backseat passengers. This feature is especially useful to keep small children entertained. The center console wireless charger is another feature that will help you stay connected. 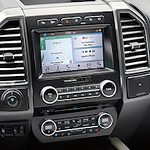 The Ford Expedition offers six USB ports along with a center console wireless charger. This ensures that all of your devices stay charged and can be used at any moment. This is a very important feature to have in your vehicle in the event of an emergency or if you just simply need to contact a family member.